Autumn is everything. To me at least. It's my favourite season as far as the contrast in weather, colour in the world around us and seasonal foods. And, this year, the beautiful extension of bright and sunny days makes it all the more perfect. As soon as September arrives things seem to go back to normal. Most are back from long summers away, I have the urge to structure proper working days once again and my work diary is busier than ever. I can't be the only one who feels that during the summer if we are not outside enjoying the very short British summer I feel like i'm missing out? My kitchen and I have been reunited. Autumn baking fills the house with so many delightful smells. Baked apples with sultanas, muscovado sugar, a little butter and cinnamon and a sprinkle of Demerara sugar are being received well, especially when served with ice cream. That soul warming aroma is just too good to describe, at least I can't seem to do it justice. Isn't everything around us beautiful right now? Although it feels a little crisper outside, we are certainly experiencing an indian summer. I love the adventure that autumn sends our way. We have been layering up for long morning walks in Hyde Park. We kind of do this whatever the season. It must be my favourite place in London. Sometimes I can't quite believe we are in a city when wandering through the park. I've been taking full advantage of enjoying sipping my coffee on a bench between Bayswater and High Street Kensington, next to a very specific tree, watching the leaves fall in all shades of autumnal tones. I often find myself lost in thought, I remember how much I loved finding conkers and wading through piles of crispy leaves when I was a child. While I daydream and reminisce the girls leaf hunt around me. The last few weeks have been such a pleasure to relive moments of my childhood and create more memories with the girls. We have loved being able to embrace being amongst the falling leaves and conkers, searching for the rare red leaves and occasionally getting caught in the rain. Ok, so that bit is not so fun for me anymore but the girls love it. And, that's what matters. This autumn is particularly special now that Lucia can be involved. She loves to pick up leaves and crunch around. Great big leaves, the ones as big as her face have become a hiding prop. Peeking and booing around the park has become her favourite game. My girls were opposite season babies which in many ways is so lovely. 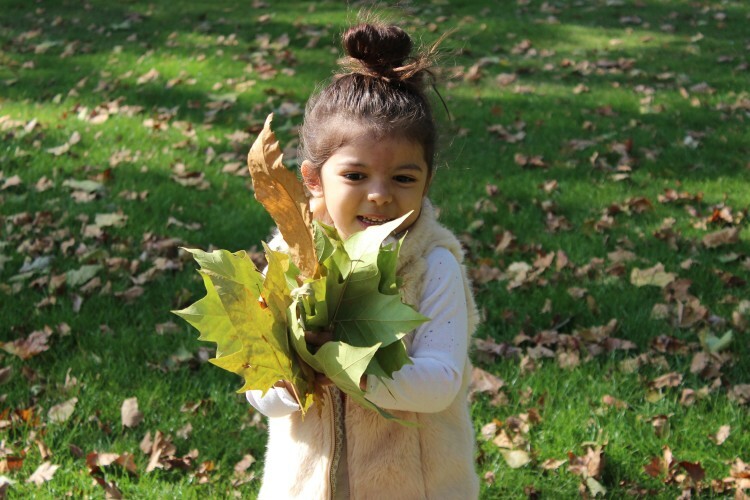 I'm experiencing autumn things with Lucia at 18 months which I never did with Gabriella. What does autumn mean to you?